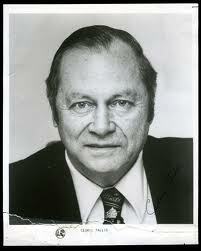 George Weiss was not an easy guy to get along with. Even his wife agreed with that, once complaining after he was let go by the Yankees that she didn’t like having him at home too much. The reason George did not make friends easily could be summed up by his business philosophy, which was to never be satisfied with anything. He always felt things could be better and to him, better meant winning more world championships and becoming more profitable. That’s the philosophy he used when he designed and built the Yankee farm system during the thirties and forties and also exactly how he ran the organization when he was named General Manager of the parent club in January of 1948. Weiss managed every detail at every level of the Yankee organization, regardless how small and that usually meant saving or making every penny possible. My favorite story about “Lonesome George” took place in 1957. Mickey Mantle had won the triple crown in 1956 and finished the ’57 season with a .365 batting average, 34 home runs and 94 RBIs. Weiss sent him a contract with a $17,000 pay cut. Mantle asked why. Weiss pointed out that Mantle had failed to repeat as triple crown winner. 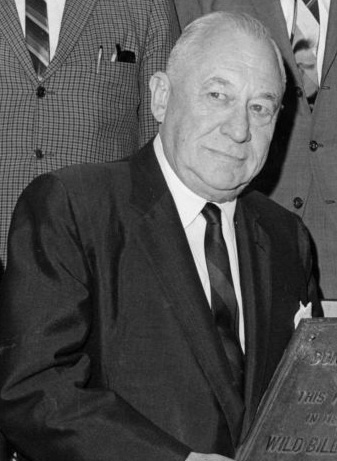 Weiss was GM of the Yankees from 1948 until 1961. During that time, New York won ten AL Pennants and seven Fall Classics. His greatest move as GM was hiring Casey Stengel. His biggest failure and the stain on his otherwise brilliant career was his refusal to sign black ballplayers. Weiss shares his birthday with this Yankee catcher, who he traded to the White Sox for Eddie Lopat in 1948 . This one-time Yankee slugging prospect and this former Yankee pitching prospect were also born on June 23rd. Tal Smith applied for his first job in baseball in 1960, when he was 27-years-old. He interviewed for an open position in the front office of the Cincinnati Reds with Gabe Paul, who happened to be the team’s GM at the time. Paul did not hire him. He told Smith the reason was he did not know shorthand, but three months later the eager exec-wannabe returned having mastered the skill and an impressed Paul gave him a job. Thus began a long association and friendship between the two men. Two years later, Paul was hired as GM of the newly formed Houston Colt 45s and again hired Smith to assist him. Though Paul remained in Texas for just a few short months before accepting the GM job in Cleveland, Smith stayed in Houston for over a decade, serving in a variety of front office positions and gaining a level of knowledge and experience that would make him one of the more respected executives in the game. Before George Steinbrenner purchased the Yankees, he had been very close to purchasing the Indians and during the negotiation process, he had developed a fondness for Gabe Paul. When his offer for the Tribe was refused Steinbrenner called Paul and told him to keep his ears open for news of other big league owners that might want to sell. A few weeks later, Paul called “the Boss” and told him CBS wanted to dump the Yankees. Though he had been promised the Presidency of the Yankees by Steinbrenner once the deal had been consummated, Paul did not completely trust the new owner. He therefore attempted to staff the Yankee front office with people he could trust and one of the first guys he brought to the Bronx as his de-facto GM in 1973 was Smith. The two men spent the next couple of years engineering a series of trades that brought the Yankees back to postseason play. I had always thought that the reason Smith left New York to accept the GM’s position with Houston in August of 1975 was that he could not get along with the unpredictable Steinbrenner. As we learned later, Gabe Paul hated working for “the Boss” so I assumed his close friend Smith did as well. But years later, when Steinbrenner passed away, some of the most glowing tributes of him came from none other than Tal Smith. Still working in the Houston front office at the time, he spoke of the Yankee owner’s persistent and unpublicized generosity with all sorts of individuals and causes. The truth probably was that Smith loved the City of Houston, loved the Astros and didn’t at all mind removing himself from a job that had him answering to two egomaniacs in Steinbrenner and Paul. He would remain associated with the Astros on and off for the next 35 years. He also became a sports industry entrepreneur. 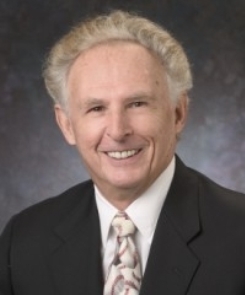 In 1981, he formed the Houston-based Tal Smith Enterprises, a firm which specialized in the preparation and presentation of salary arbitration cases. The company has done work for 26 different big league teams. The only other member of the Yankee family born on this date is this one-time reliever. His full name is William Frederick Woodward and he was born in Miami, Florida on this date in 1942. 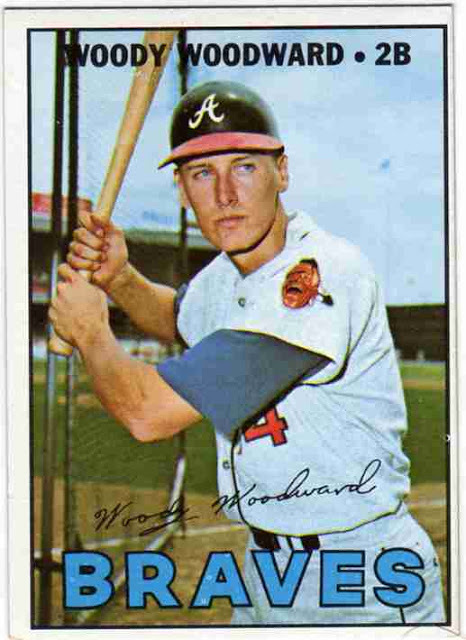 After playing two years of college ball at Florida State he was drafted by the then Milwaukee Braves in 1963 and made his Major League debut that same September. He would spend the next eight seasons as mostly a utility middle infielder, first with the Braves and then, after a June 1968 trade, with Cincinnati. He was pretty much one of those good-fielding, weak-hitting guys who used to regularly play the positions between first and third for most Major League clubs back then. His lifetime batting average was .236 and he hit just a single home run during his playing days, a two-run shot off his ex-Atlanta teammate, Ron Reed, while he was playing for the Reds in 1970. As it turned out, that home run would not be the biggest shock of his career. That happened in 1971, during a game in LA against the Dodgers, when a 10 pound bag of flour dropped out of the sky and landed just a few feet away from where Woodward was standing at shortstop. After hanging up his spikes, Woodward eventually became head coach of Florida State, where he oversaw four very successful seasons of Seminole baseball. He then accepted the assistant GM position with the Reds in 1981 and in 1985, George Steinbrenner hired him to serve as an assistant to then Yankee GM, Clyde King. Those were the days Steinbrenner was firing his GMs more frequently than the Kardashian girls use a mirror. In 1987, it became Woodward’s turn to take the job. He lasted in it for about a year. During his tenure, Lou Piniella was the Yankee field manager and he’d often meet with Woodward to discuss the team’s personnel needs. One day, Sweet Lou asked Woody if George Steinbrenner was as rough on Yankee GMs as he was on his managers. In response, Woodward opened his desk drawer to show Piniella it was filled with prescription drugs and antacids. There were probably times during his days working for “the Boss” that old Woody wished that bag of flour that fell from the heavens sixteen years earlier had hit him square in the head. During his single year in the job, his trades brought Rick Rhoden, Pat Clements, Cecilio Guante, Ron Romanick, Alan Mills, Randy Velarde, Mark Slas and Bill Gullickson to the Bronx and his most notable draft choice was the outfielder, Gerald Williams. Steinbrenner then replaced him with Lou Piniella and a few years later, Woodward became GM of the Mariners, where he traded for Randy Johnson, drafted Alex Rodriguez, Brett Boone, and Raul Ibanez, hired his buddy Lou Piniella as manager and made Seattle one of the better teams in baseball. He still works for the Mariner organization as a part time scout. Woody shares his birthday with this Yankee pitcher. Cedric Tallis became George Steinbrenner’s GM, right after the Yankees won their first World Series for the shipbuilder’s son in 1977. That was right after Gabe Paul, who Tallis succeeded as GM, was getting most of the credit in the media for building that championship team and right after the Boss got sick and tired of seeing Paul get all that credit. By 1977, Steinbrenner was pretty much convinced he was a baseball genius and that he only needed a GM to carry out his orders. Paul had too big of an ego to hold the title in name only, so the Yankee owner replaced him. Tallis was actually a highly experienced and capable baseball executive who had spent twenty years running minor league franchises. He became business manager of the American League’s newly formed Los Angeles Angels in 1961 and seven years later was hired as the first GM of the new Kansas City Royal franchise. It was Tallis who started the famous Kansas City Royal Baseball Academy with its mission of converting great athletes with no baseball experience into Major League baseball players. 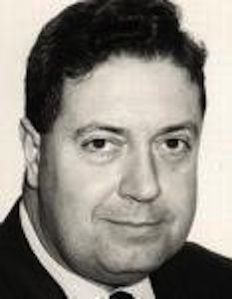 His astute draft management and clever trades helped the Royals finish with 85 wins in just their third season and earned Tallis the Sporting News Executive of the Year Award in 1971. Three years later he was hired by the Yankees to oversee the reconstruction of the original Yankee Stadium. When that project was completed he became Paul’s assistant. He was Steinbrenner’s GM during the 1978 and ’79 seasons. He’s the guy “the Boss” sent to fire Bob Lemon in 1978, after Lemon’s pal and former Cleveland Indian teammate, Yankee president Al Rosen refused to do so. He’s also the Yankee GM who signed free agents Goose Gossage and Tommy John. Tallis’s tenure in the job did not survive the tumultuous and tragic 1979 season. Gossage’s thumb injury followed by Thurman Munson’s tragic death doomed the Yankees’ chances for a three-peat. Steinbrenner decided he wanted Gene Michael to be his team’s new GM so he kicked Tallis upstairs, where he remained employed by New York for three more years. His next job was as executive director of an organization known as the Tampa Baseball Group, which was formed to lure a baseball team to the central Florida city. He died of a heart attack in 1991. He was 76-years-old. Tallis shares his birthday with this former Yankee outfielder and this former Yankee pitcher. After winning a Purple Heart in WWII during the invasion of Italy, Bill Bergesch returned home, used the GI Bill to to get his business degree and began a long career as a baseball executive by accepting a job in the St. Louis Cardinals’ minor league organization. Ten years later he made his indelible contribution to that franchise when he became the guy who signed the great pitcher, Bob Gibson. He was promoted to Cardinal’s scouting coordinator in 1959 and then was hired by the Kansas City A’s as an assistant GM, where he worked for the franchise’s new, slightly off-kilter owner, Charley Finley. He was hired by the Mets the following year to help that brand new franchise create its minor league organization from scratch and in 1964, was hired by the Yankees to serve as the team’s traveling secretary and manager of Yankee Stadium. He then changed sports, accepting front office positions with two Big Apple soccer teams. It was as GM of the New York Cosmos that Bergesch signed Brazilian superstar Pele out of retirement. He then changed professions and industries, leaving sports and going to work for the next decade as a venture capitalist. By then, George Steinbrenner had taken over the Yankees and hired Bergesch as the team’s scouting director in 1978 and then promoted him to vice president of baseball operations a couple of years later. This was right during the time that “the Boss” was in his most tyrannical state as owner of the Yankees. In fact, Steinbrenner decided that he could be his own general manager, so he pointedly refused to give Bergesch that title. As it turned out, perhaps “hatchet man” would have been an even better one. Regardless if it was devastating young Yankee prospects like Dave Righetti by unexpectedly demoting them back to the minors, firing Bob Lemon or Yogi Berra as skippers even though they each had been promised full years in the job or reminding established veterans like Tommy John that they were being paid too much money to have a bad outing, it was Bergesch who would be sent to deliver the ill-timed news from George. In fact, I remember thinking that Bergesch had as tough and thankless a job as Richard Nixon’s chief-of-staff did after the Watergate break in was discovered. Before too long, Bergesch had carried out so many unpleasant Steinbrenner-directed edicts that he became a very unpopular guy in the Yankee clubhouse. The problem was that even though he was doing what George told him to do, the Boss would blame the poor guy whenever any of the things he did back fired or caused negative press, which happened about three times a week back then. It was the ultimate no-win situation. The irony was that Bergesch genuinely liked Steinbrenner and enjoyed their friendship. He cited this as the reason why he had decided to leave the Yankees in 1984. He told the press he needed to go in a different direction. Unfortunately for Bergesch, that direction turned out to be working for the one owner in baseball who was capable of acting even more irrationally than Steinbrenner did at the time. Bergesch became the GM of Marge Schott’s Cincinnati Reds. Not only did Bergesch value his friendship with the Boss, the feeling was mutual and when Steinbrenner entered a much more rational period of his tenure as Yankee owner in the early nineties, he brought Bergesch back to serve as Gene Michael’s assistant in 1990. The grateful executive would remain part of the Yankee family and good friends with George for the rest of their days. Bergesch passed away in 2011 at the age of 89. Bergesch shares his June 17th birthday with this former Yankee outfielder. The Yankee dynasty was a product of great players but those great players were a product of great front-office management and player development skills. Wealthy Yankee owners like Jake Ruppert, Del Webb, Dan Topping and George Steinbrenner came up with the necessary cash but it was the guys like Ed Barrow, George Weiss, Gabe Paul and Brian Cashman who converted that cash into the rosters that won pennants and World Series. And because the Yankees have been so successful for so long, even their GMs become legends and get inducted into Cooperstown. So how come nobody remembers Roy Hamey? Henry Roy Hamey succeeded George Weiss as the Yankee GM right after New York had been dramatically upset in the 1960 World Series. Topping and Webb were the Yankee co-owners at the time and it was their decision to fire Casey Stengel after losing to the Pirates and make Ralph Houk the team’s new skipper. It was also their decision to simultaneously force Weiss out as GM and replace him with his former assistant. Weiss had been the guy who originally hired Hamey to run the Yankees’ Class A minor league franchise in Binghamton in 1934. He did such a great job there that Weiss promoted him to run New York’s top minor league franchise in Kansas City. The two men made New York’s farm system the best in baseball and Weiss fully expected to become Yankee GM when Barrow retired and Hamey fully expected to replace Weiss as director of the team’s minor league operation. 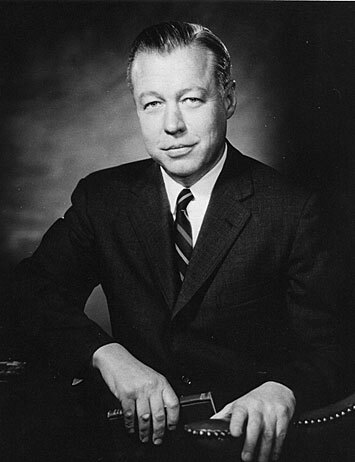 What neither man expected however was Larry MacPhail becoming part owner with Webb and Topping of the Yankee franchise in 1946 and effectively making himself the team’s new GM. Weiss licked his wounds and stuck with the organization but a disappointed Hamey jumped ship and became president of the American Association. A year later, he was hired as GM of the Pirates. He spent three seasons in that job but when he failed to produce a winning team he was replaced by Branch Rickey. That’s when Weiss, who had finally become Yankee GM in 1947, rehired Hamey to serve as his assistant GM in New York. Hamey remained in that post for three years, leaving to become top dog for the Phillies in 1954. He once again failed in his efforts to build a winning club and “resigned” in 1958 to go back to work in his old job as assistant Yankee GM. The rumor at the time was that the Yankees had tried to hire Milwaukee Braves’ GM, John Quinn for that job but he wanted assurances that he would replace Weiss as GM when Weiss retired or was let go. 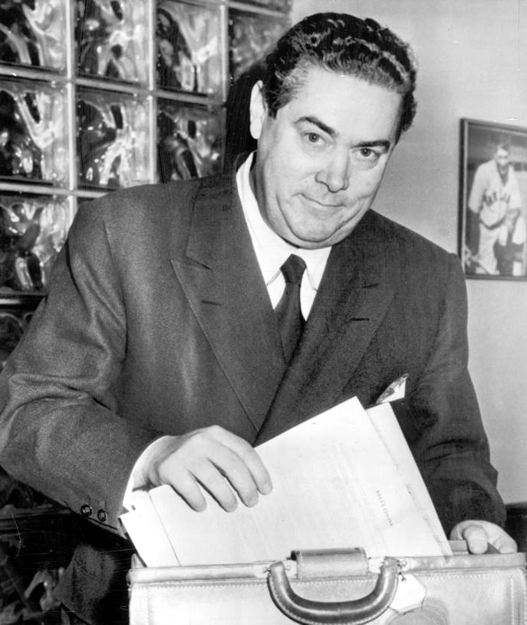 When New York wouldn’t give Quinn that guarantee, the GM of the 1957 World Champions accepted an offer to become GM of the Phillies, replacing Hamey. If in fact Hamey was fired by the Phillies it proved to be the biggest break of his career because it put him in place to succeed Weiss two seasons later. Hamey served as GM of three Yankee teams. Those three teams won three AL Pennants, two World Series and 309 regular season games. He also managed the Yankees first three amateur drafts. Though its true that Hamey inherited a loaded Yankee roster he did engineer several key acquisitions and call-ups during his short tenure at the helm. His biggest trade, which took place in November of 1962 was a controversial one in which he sent the popular Yankee first baseman, Moose Skowron to the Dodgers for pitcher Stan Williams. It was definitely the right time to deal Skowron but Williams turned out to be a dud in pinstripes and the deal was not remembered kindly by most Yankee fans of that era. In 1964, Topping and Webb asked Hamey to retire as GM so they could promote Houk to that job. Hamey did as they wished and became a part time Yankee scout. When the new Seattle Pilots franchise was struggling to stay afloat after the 1969 season ended, AL President Joe Cronin asked Hamey to run the team until new ownership could be found. That would be the Havana, Illinois native’s last job in baseball. He retired to Arizona, where he died in 1983 at the age of 81. Hamey shares his birthday with this former Yankee manager and this one-time Yankee outfielder.